Sony Mobile Communications contributed its share in ongoing Mobile World Congress by launching two new smart phones-the new Xperia P and Xperia U. The phones part of the Sony’s Xperia(TM) NXT series provide mixture of technology with infotainment. Both smart phones have 1 GHz dual-core processors for world class speed and performance. .
Xperia P is launched on Android platform 2.3 (Gingerbread) and is expected to be updated to Android platform 4.0 (Ice Cream Sandwich) about in the second quarter of 2012. Xperia P comes with 4" Reality Display equipped with Mobile BRAVIA Engine. On its display WhiteMagic(TM) technology for an ultra-bright and power efficient viewing is used. 1 GHz dual-core processor for super fast performance is along with 16GB flash storage capacity. 8MP camera with unique fast capture, HD recording and Sony technology to capture 2D and 3D panoramic image are some of other exciting features of the phone. Next interesting features it includes easy HDMI and DLNA connectivity to distribute content on any screen. NFC (Near Field Communications) enabled to access a growing range of NFC applications and services as well as Xperia SmartTags. It is available in a choice of silver, black and red, all with an aluminium unibody. Xperia U on the other side is a 3.5" Reality Display powered by Mobile BRAVIA Engine. It has 1 GHz dual-core processor for excellent performance. It is equipped with 5MP camera, HD recording and Sony technology to capture 2D and 3D panoramic images. xLoud and 3D surround sound audio technology provides clear and loud voice. One can choose it from the choice of white or black, with pink and yellow exchangeable caps for the base of the smartphone in the box. Powered with Android 2.3 (Gingerbread) is set to upgrade to Android platform 4.0 by the second quarter of 2012. 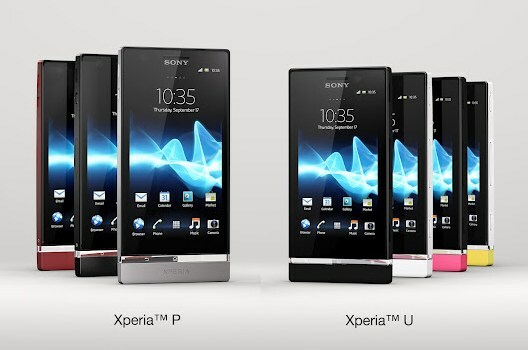 For retail selling Xperia P and Xperia U will be available by the second quarter of this year.